On May 26, 2010, former Falcon soccer star Marcus Hahnemann '93 became one of three goalkeepers named to Team USA, which is set to vie for the 2010 FIFA World Cup. This is the 37-year-old's second consecutive appearance on Team USA. The U.S. team's opening match pits them against England on June 12, in Rustenberg, South Africa. The game is set to begin at 11:30 a.m. PDT. The World Cup has been awarded once every four years since 1930. Its only hiatus came during World War II. Team USA is one of the 32 teams competing for the title in this year’s host nation of South Africa. The soccer world championship play spans a month, and its final game is typically the most widely watched sporting event in the world. Hahnemann also played on Team USA in the team's 2006 appearance in Germany. 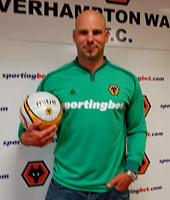 Goalkeeper and 1993 Seattle Pacific alum Marcus Hahnemann recently signed a one-year contract with the Wolverhampton Wanderers. Commonly known by the team's nickname, the Wolves, Wolverhampton recently rose to the English Premiere League. Hahnemann signed with the team in June 2009 after being released by Reading, the team for which he'd played since 2002. While with Reading, Hahnemann missed just one game during the 2005–06 season, which culminated in Reading's winning the championship and boosting the team to the top flight of English soccer for the first time in team history. About joining the Wolves, he said: "I'm excited to be here. Wolves were one of Reading's main rivals and I've always had good experiences when I've come up here. The games here have always been good and it was a great opportunity, one that I couldn't turn down." During his professional career, Hahnemann has also made seven appearances for international play with the United States National Team. He was a member of the 2006 U.S. World Cup team. As an SPU falcon, he protected the goal to help the falcons win the NCAA Division II championship. He lettered four seasons at SPU from 1990 to 1993, and the three-time All-American capped his stand-out collegiate career by helping the falcons to the 1993 NCAA Division II championship. SPU compiled a 64-9-5 record and blanked 46 opponents with Hahnemann defending the goal. Read more about Hahnemann in Response's original story, and discover what makes him so popular with the fans. For more about Hahnemann's trip to Team USA, visit the Falcons athletics site.